Onto brighter and better things. I will still continue to update you on my machine, what I like and dislike about it as I use it more and more. Any feedback you can give or any questions or comments I would love to hear them 🙂 Thanks again for all of the support. Also don’t forget to vote on Heather’s Giveaway draw will close today!! Val, I'm glad it worked out with the machine! Nothing like a good dealer. I hope this will be your dream machine. Isn't it a shame that Janome has to have such poor customer service? I'm glad Jim was able to help you out. So glad you got it all sorted out. I have loved my Janome for well over 20 years. It's failing now, but it has served me very well. I hope you love yours just as much now that you have one that works! 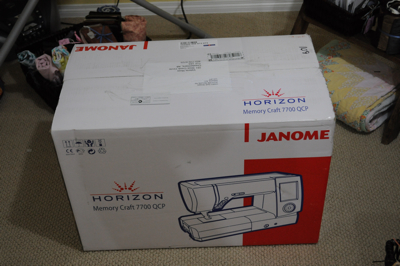 I thank you for your kind comments and am very glad you are enjoying your NEW Janome Horizon 7700. I would like to say that Janome relys on the dealers to communicate with the consumer as Janome Canada is a wholesale company not retail company. It was my responsibility make sure that you the consumer are happy with your purchase. We have been a Janome dealer for the past 30 years and have to say they have been the BEST sewing company for dealer service. I am from Laval, Quebec, Canada and I share the same bad experience from Janome Canada Headquarters and I sympatize with you. Yes you are so right, THERE IS NOTHING SUCH AS A GOOD DEALER ! and don't expect much fromn headquarter !! !